Could you give me your opinion on this kit? That's all there is to this kit. 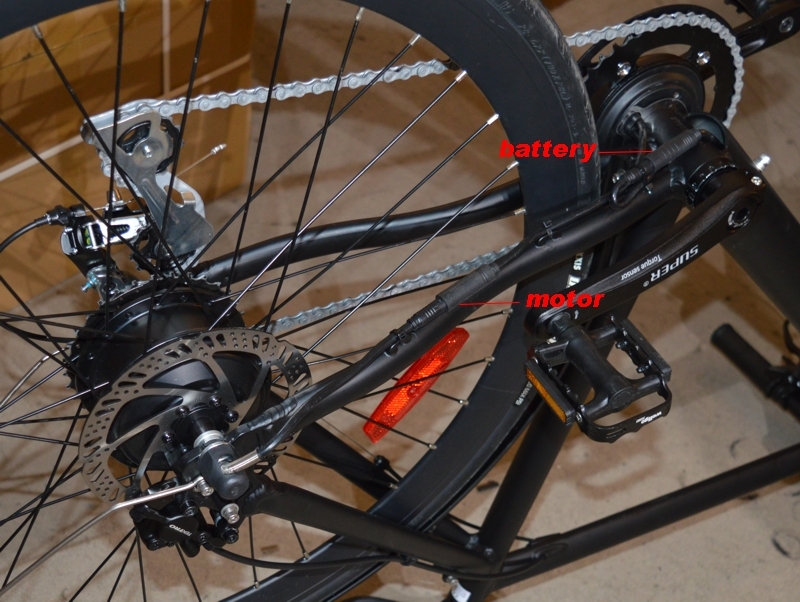 It's a pretty high quality build, Hollowtech crankset, torque sensing. The whole thing as you see on the picture weighs 1,023grs on my scales. I have been riding around town with it for a month. I absolutely love it. The whole thing is virtually silent, no creaking noise whatsoever. I find that I just use the gears instead of changing assist levels on an LCD. Would you pay £120 for it? My first thought was it's pretty expensive for a controller as all donor bikes have already got a crankset. But then, I love its minimalist approach. I would pay it but would you? Looks interesting Woosh, There's not a lot of choice with TS kits, so you could be onto something. I don't think it's silly money. I'm sure you could offer it with a motor and battery for a reasonable price. The motor lead looks a bit short to join up with the motor. The motor lead was for an Aikema motor which comes with its 9-pin cable about 4" longer than usual. That simple TS kit is ideal for any 9 pin hub motor and neater then the BMSB KT TS kit with TSO6S controller. Shame it is only single chain ring a double would be great. What it the controller rating and voltage ? Also are TS/controller available in case of failures. I have for a while been considering a TS crank kit for at least one of my bikes but wary that TS06S doesn't appear to be available as a separate spare part. it works well with all the 9-pin motors I've tried. Shame it is only single chain ring a double would be great. it has 135 BCD system ring, so more rings may be possible. it would be a straight swap out, 5 minutes job, no special tool, just allen keys. I am thinking it would suit high quality bikes where customers may be willing to pay a premium to avoid wiring. Looks very good - had it been available when I did my bike last autumn I would have been very tempted. It took me most of a day to sort out fitting the PAS sensor to my hollowtech - and that's with having all the tools I could need (including a laser cutter). Brilliant to just bolt it in and be ready to go! I don't see a wire for a display - is it a bluetooth thingy or do you have to fly blind? the battery cable has 6 pins. The LCD plugs into the battery. If you don't want to use the LCD, you change gear to adjust the ratio pedal pressure to speed. I thought at the beginning that it won't fly without an LCD and +/- buttons to change assist level but after a few minutes, I found it's just as natural to change the gears instead of pressing the +/- buttons. If you run without the LCD, you may break current law on limiting speed assist to 15.5mph. 48v ? If your manufacturer could make a PAS + 48v sine wave controller with Hollowtech crankset and 130 BCD spider you would have a customer at £120. I would also want a seperate LCD connector + battery + motor out. I am sure that can do that. I must say I was disappointed - 130 BCD is certainly 10 times more popular. unfortunately, they've already made the tools. I would also want a seperate LCD connector + battery + motor out. you can make your own LCD connector, I keep spares for that. The connector on the battery takes the same KM529 and KD68C LCDs that we use on our kits and bikes. 130 BCD is certainly 10 times more popular. I find it really strange when this sort of thing happens, why not go with a popular size? It must be one of the first considerations when planning the design surely, or maybe I'm missing something. i guess the space needed for TS and controller could have made them go the few mm's larger. The Chinese are good at cheap and easy - they have issues with good industrial design. I find it really strange when this sort of thing happens, why not go with a popular size? if there is much demand for 36T/38T rings, I would bring them in from China, they charge me about the same money for 130 or 135 BCD (about £10). I would want 32/48 or 34/48 double a hub drive even a TS hub drive, for me I find a single doesn't either cut it on hills or on the flat. Either spin too much or to high a gearing even with 9/10 speed. Most people doing a conversion are (or were in the past) fairly keen cyclists who are used to lots of gears. It could be a better sales ploy to fit dual chain rings as standard - a more attractive buy even if the cost is marginally higher. I seriously considered a Rio MTB before going down the conversion kit route : it was that single chain ring that put me off buying one. Now with 27 gears on hand, I find that I use the middle chain ring extensively when riding (slowly) with unpowered friends - the large ring is reserved for when I'm whizzing along by myself. I will look carefully at 34T/48T. Chinese New Year holiday starts next week, I can't do much until they come back in a month's time. Thanks for the reminder Tony, Chinese New Year. Not a good time to order anything. Would you pay £120 for it? I think 120 is rather cheap than expensive if it works reliable. 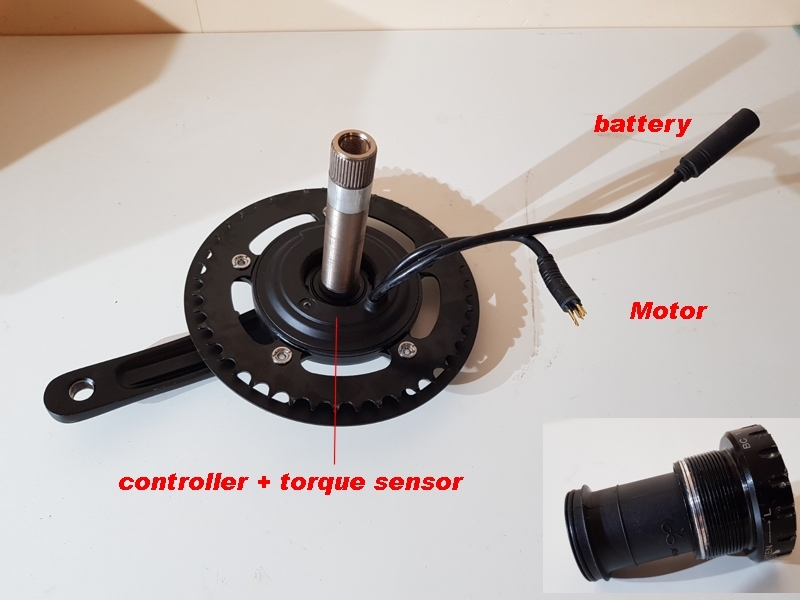 Not my favourite solution but the idea is not bad..... torquecontrolling and hollowtech-II compatible is for sure something nice in compare to other cheap solutions on the market. Where is the chain-line, less than 50mm? Where is the chain-line, less than 50mm? On my Giant test bike, it's on gear No 5 of 8, so it should be less than 50mm. Edit: just measured it: 50mm. I think 120 is rather cheap than expensive if it works reliable. that price £120 is as it is. You can fit an optional LCD if you wish. I find that I cope easily without the LCD, just change gears to suit the terrain. No need to run the LCD cable to the handlebars. I am getting a very compact 36V 10AH battery made to go with it. The battery weighs just 1.2kg. The main problem is the length of the BB. It's made for 68mm / 73mm bottom bracket. Quite a few nice bikes are fitted with wider BB.